A grandson of the couple above recently sent me this photograph, which is surely one taken to commemorate their marriage. Though it may be hard to see on the computer screen, her left hand, with an engagement ring on it, is carefully posed under her chin. His left hand with its wedding band is carefully posed on the table. And then there is the white dress, of course. I am related to both the bride and groom, Charlotte and Gustave. Gustave is my great-grandmother’s brother; Charlotte is their first cousin. I have written briefly about their marriage before — about how it was not (in this time, in their native country or in their particular families) an unheard of thing to marry one’s cousin. Indeed, Gustave’s younger sister Johanna was married to another first cousin (who also happened to be Charlotte’s first cousin, too). 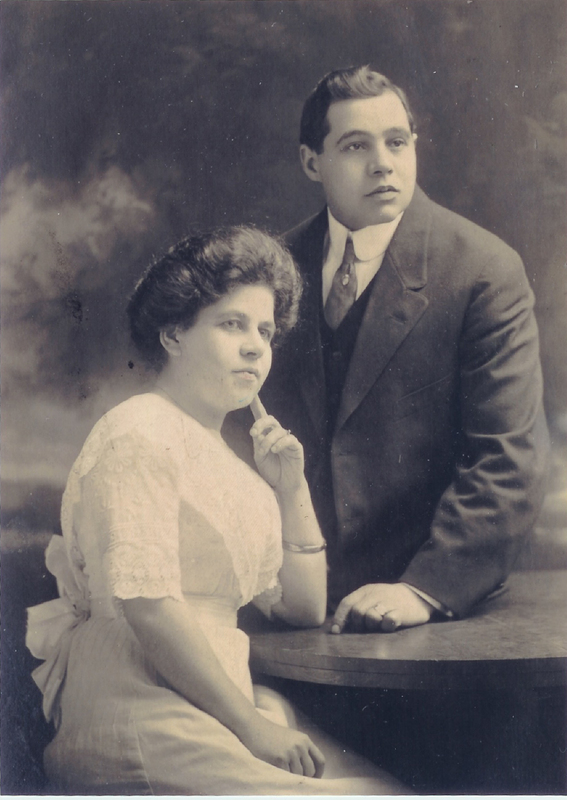 Charlotte and Gustave married in 1912 in Cleveland, Ohio, after immigrating (in 1908 and 1907, respectively) from their native villages in Slovakia. They had two children and, eventually, three grandchildren, with whom they were kindly and generous, taking them to the park, playing with them, and reading them books and comic strips (one such reading, recorded on a reel-to-reel tape recorder, later digitized, is now a file on my desktop thanks to one of those lucky grandchildren). Gus and Charlotte’s branch of the family was one that was lost to mine for some time, because of the vagaries of migration and war and time. Now, because of the very fact that I wrote an essay about Gustave here a little less than a year ago, which someone serendipitously found, we are all connected again.